Summer is just around the corner! I envision myself at a beach or on a roof top bar sipping an icy cocktail while watching the sun go down. Warm velvet nights and long days full of sun are almost here. Mostly I will be wearing relaxed bohemian inspired yet minimalist ensembles this summer. So let me present to you an example… My favorite wide leg pants paired with a white t-shirt. The ultra high wedges add edge to an otherwise austere look. To take it to another chic level, add a statement gold piece such as the Angel ring above. By the way, if you are curious I found this cute ring at ShopNBC. There are tons of other gold jewelry and some unique pieces went onto my lust list. You know, summer, Christmas, green and gold.. it all comes together! I am in love with the Marni wedges. Love these summer picks! My fav are the green pants, I’ve bought some myself for summer and im obsessed with them! i’m following you with bloglovin now! gasp!! i neeeed those wedges! so awesome! 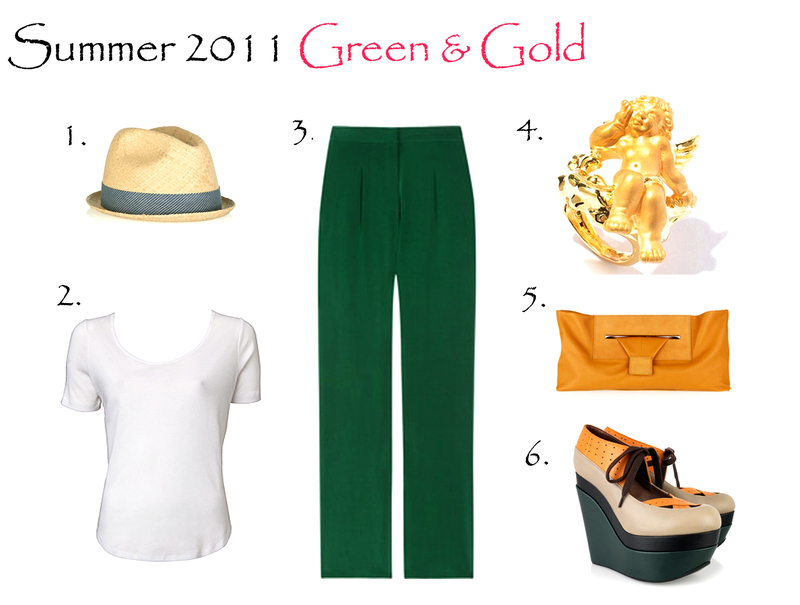 :) the green and gold combo is stunning… esp the lovely colored green pants! Those pants and shoes must look pretty amazing together. Good picks.